Last Friday, my husband and I took our three kids and two additional munchkins apple and peach picking at Outhouse Orchards, located on Hardscrabble Road. Given that infelicitous pairing of names, I halfway expected to drive into a tunnel and come out on the other side to find the technicolor world of Westchester, NY had faded to a Depression-era black-and-white farmstead, complete with dust clouds and some gaunt looking cows – the reverse of Dorothy heading to Oz. To be honest, we picked Outhouse in part because it seemed like a lower-key experience than some of its neighboring farms boasting McMansion-sized bouncy houses, pumpkin slinging, and draconian payment policies. (“No, parents may not watch their kids bounce unless they also have purchased tickets.” “Yes, you are required to buy all $108 dollars of apples you picked, even though you thought you were picking Galas, not Guccis.) With seven of us and a budget, it didn’t make sense to try to Disneyfy the experience. We just wanted some fruit and cider donuts. Outhouse turned out to be an ideal place to get both. We arrived ahead of most of the crowd, so many times we were the only people in sight. Just us and the apple and peach trees. For months, it’s felt like New York has been unable to pick a season, but Friday was a dream of an early fall day: Sunny, but not hot, with a light breeze and blue skies. Part of the orchard was nestled in a valley, so we hiked down over a green ocean of rolling tufts of grass. The kids took turns wielding apple picking poles or looking for low-hanging fruit in search of the most beautiful apple in the orchard. There was a lot of good-natured apple trash-talking before this one won by virtue of showing up with its own crown. After we’d filled half our bag, we hiked back up the hill and still further up (past the corn maze, past the raucous school groups getting tractor rides) to the peach orchard. From there, we could see rows of saplings below low-slung clouds in shades of lavender gray. It was late enough in the season that the trees were surrounded by fallen fruit, meaning a lot of squishiness underfoot, but nobody minded. We unanimously agreed that while the apples were good, the peaches were divine: plump, rosy, and sweet. One tip for fellow harvesters: You can buy either a $10 bag or a $25 bag. We chose the latter, but short of a bodybuilder in your party or a wagon that can navigate bumpy terrain, I would not recommend going quite that big. We gathered more fruit than my husband – our designated pack mule – could carry comfortably – and more than our mesh bag could handle. It began splitting on the way down the hill from the peaches, and we barely made it back to our vehicle. And yes, true to the orchard’s name, there was a row of porta-potties conveniently placed at the bottom of the hill. One of the main insights from the book Sticky Faith: Everyday ideas to build lasting faith in your kids, by Dr. Kara Powell and Dr. Chap Clark, is that how parents practice and talk about their faith with their kids is crucial to passing on authentic faith. If parents hope to cultivate a Christian identity in their children — one that survives the tumultuous teen and questioning young adult years when young people are “discovering who they are and making the commitments toward who they want to be” — they have to do more than just go to church, pay their tithes, and send their kids to youth group. The authors’ research, conducted under the auspices of the Fuller Youth Institute and Fuller Theological Seminary, concludes that “it’s never too early” to start building faith that sticks into your children. To do that, parents need to go beyond teaching Christianity primarily as a system of “do’s and don’t’s” and obedience, and instead help kids experience what it is to know and trust Christ. Practical ways to do this include: surrounding your child with a Christian community (mentors, peers, family) that will dialogue honestly about even difficult issues and doubts; using rituals and celebrations (like prayer at birthdays) to reinforce identity; focusing on character growth rather than behavior; and modeling a relationship with God. As a father of four girls one of my greatest desires is to pass on to them a deep understanding and awareness of the experience of God. My hope is that they would feel connected to God and the story God is unfolding in their lives and in the world around them. Will they see themselves as part of God’s story? Will they feel close and connected to God as they navigate decisions that come their way and pursue risks on the horizon? Will they say yes to all that God is inviting them into? Jared’s language and spiritual practices are steeped in the Ignatian tradition and borne of out his long experience as a contemplative practitioner, spiritual director, and teacher, as well as his pastoral ministry in the Vineyard, an association of evangelical churches explored at length in Tanya Lurhmann’s When God Talks Back. Lurhmann’s psychological and anthropological study of the Vineyard and its practices of listening and prayer leads her to conclude that connectedness to God, while full of mystery, is a learnable skill. Taken together, Sticky Faith and When God Talks Back (not to mention the larger backdrop of Western Christianity’s well-documented and ongoing failure to pass on faith to the younger generations) provide strong rationales for exactly the kind of imaginative prayer experience and sustained spiritual formation that Jared’s book is meant to guide parents and children through. Over the course of a year, the book explores six theological themes: God’s Love, Loving Others, Forgiveness, Jesus is the King, The Good News of God, and The Mission of God. Each theme is divided into 7 weeks, with six weeks of imaginative prayer sessions followed by a week of review. Each (non-review) week is further broken down into repeated sections. 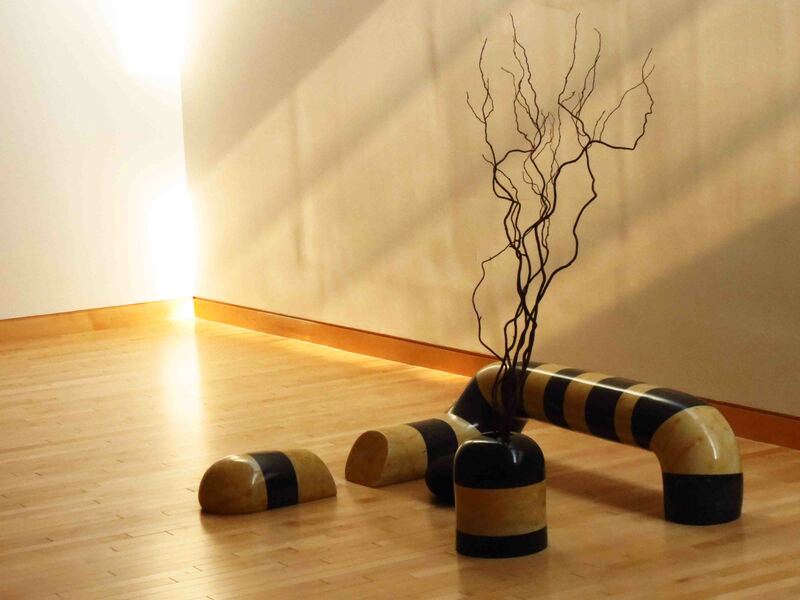 “Connection and Formation” introduces the theme for the week, through a theological reflection, poem, perhaps a story. Next, a “Q&A” provides a brief catechism to help children remember the theme. The “Imaginative Prayer” is the heart of each week: a guided prayer, rich with imagery, sensory information, and metaphor that invites children to enter into an experience with God that they can see, hear, smell, taste, and feel. The “Q&A” is then repeated, to emphasize the theme that the child has now experienced in their own imagination. Each week concludes with reflection and devotional prompts for “For the Parent or Mentor” and a reminder for children to journal (write or draw) for twenty minutes, based on a question that will lead them to reflect on their life that week — not “just” the spiritual formation part — in light of the explored theme. The review week wraps everything up by bringing back all the creedal questions (catechism) from that section and through suggested activities and questions. One of my favorite imaginative prayers in the book is Jared’s picture of Jesus coming to defeat the power of sin. He asks the child to imagine a deep cave filled with seven giant faucets, all spouting different-colored water, one faucet and color for each of the deadly sins. Together, the faucets fill a cave that is “dark and murky and smelly.” The child is asked to imagine a wheel that will turn all the faucets off. It’s too heavy – the child can’t turn it. But Jesus steps in and turns the wheel right off, and instantly the cave fills with clean air, with sweetness and light. In this and many other instances, Jared’s metaphors are concrete, vivid, and fresh, and I believe will help children — and their parents and other spiritual mentors — understand, experience, and remember abstract theological concepts in a new and “sticky” way. Jared’s focus on building a shared theological vocabulary to go with a shared experience of God also lays the groundwork for many years of faith-building conversations between parents and children, between siblings and Sunday School peers, and between each member of the family and God. Every first Friday is free admission at the Noguchi Museum in Astoria, Queens, so last week I took my three kids with me to wander around. One of my friends joined us with her two-year old. 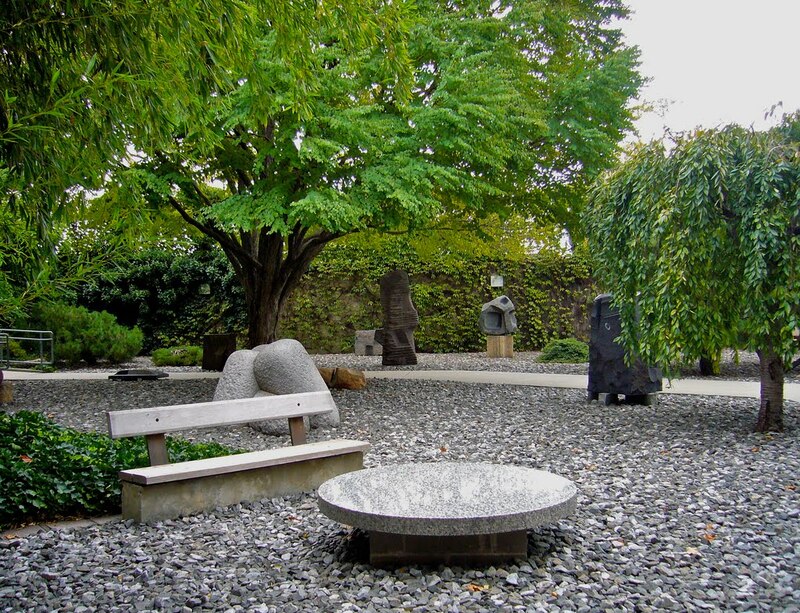 Isamu Noguchi was a Japanese-American of mixed ancestry. (His father was a Japanese poet; his mother an American writer.) He was a sculptor, designer, and activist on behalf of Japanese Americans interned during World War II. It’s a testament to his influence on modern design that his paper lantern designs look like something you might buy at Ikea. The museum looks like nothing much from the outside – gray brick, low-slung, industrial, flanked by power lines, the Southern Astoria waterfront, and Costco (which my family visits almost as religiously as church). Inside, it is minimalist and modern: long, spacious rooms with clean lines, white walls, polished wood floors, and impeccable lighting. Since we had little ones in tow, the museum was not a leisurely experience — we careened through the museum at a break-neck pace suited to the first-grader and toddler — but it wasn’t stressful either. It’s a kid-friendly place, with family guides and pencils provided for children and small enough to be manageable in an hour or less, although it would absolutely reward several hours of your time and attention. 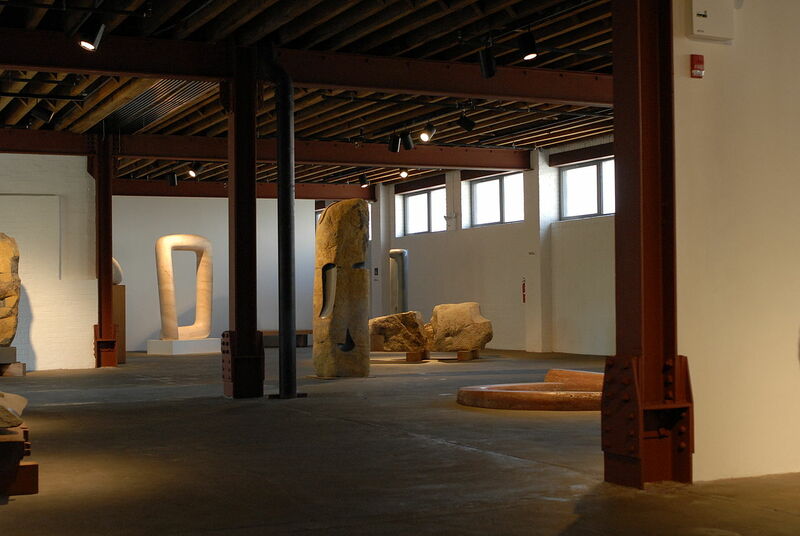 Noguchi’s sculptures are varied and visually and texturally engaging, and they’re not roped off, so kids can get nose-to-nose with them. While I can’t say my brood came away with much intellectual knowledge gained, they had fun identifying sculptures (none of them have identifying plaques, so you have to match them with their photos and names in printed guides) as well as making up their own names based on what they thought each sculpture looked like. All things considered, I was pleased with their level of imaginative engagement. We also had a brief discussion on the way out about who decides what constitutes “art.” Is it the wealthy who control the art market and dictate taste to the unwashed masses, as my worldly-wise high-schooler asserted, or is there something more transcendent at work? What if you don’t enjoy looking at a painting by Picasso (as my son put it, “that guy who makes the weird faces”) but you have an understanding of what he was trying to do, or vice versa? This discussion proved prescient as we trooped over to the Socrates Sculpture Park, a free outdoor space just across the street from the Noguchi. Socrates is a hoot because you can never be sure what you’ll find there. On this day, it was goats. Lots and lots of goats. All life-size, except for one gargantuan head-on-a-stick that looked like the world’s most diabolical cake pop. [Nari Ward’s “G.O.A.T., again”] examines how hubris creates misplaced expectations in American culture. Ward recasts tropes of outdoor structures – the monument, the playground, lawn ornaments, architectural barriers, and the advertising sign – into surreal and playful creations. This expands the artist’s ongoing exploration of cultural identity, social progress, material histories, and our sense of belonging . . . While we were at the park, however, most of our focus was simply on enjoying the last Friday of summer. The kids, whose observational skills and brain power had already been depleted by the Noguchi, shared fig bars, cheese, and crackers and lounged on stadium seats plopped in the middle of the park. It was a beautiful, sunny morning punctuated by a sharp breeze coming off the water. The red and gold “Apollo” sign — several miles from the original in Harlem — stood out against the green grass and shrubs, the backdrop of the river and the Manhattan skyline, and the bright, blue sky. *For those keeping track, the answers to those questions are: a) no, and it’s a crying shame; b) wouldn’t you? ; c) yes, and yes; and d) yes, but we ended up ordering other things too. My son is inexplicably a fan of the baked chicken cheese roll, even though it tastes like someone stuffed microwaved pasta Alfredo into a hot pocket made of cornstarch packing peanuts. Summer in the Psalms is a sermon and written reflection series based on the weekly Psalm and associated readings from the Revised Common Lectionary. In this passage in Matthew, the disciples are walking with Jesus every day. They watch everything He does and they listen closely to all His words and His teachings. They experience the compassion He has for people, and His willingness to heal them as He goes from place to place. They feel the love and forgiveness that He passes on to each and every person He encounters. And then Jesus asks them, “Who do people say that I am?” When Peter answers that he believes that Jesus is the Christ, the Son of the living God, Jesus tells Peter that he didn’t get this knowledge from the people or the things he has seen, but from God. God, our Father, is so intimately concerned about what we know and how we learn it, that He tells us the things we need to know. Our Father in heaven loves us so much that He wants to tell us things about Himself: things that will bless us, things that will cause us to learn more about Him, things that will heal us, things that will comfort us. Everything we need to know comes from God, and it is His great pleasure to communicate with us. Peter needed God to tell him the truth about who Jesus was, but he also needed to hear the truth about himself. Jesus responded to Peter by telling him who he was: the church’s rock, the keeper of the keys of heaven. These are truths that came straight from God, truths Peter could never have arrived at on his own. He needed Jesus to tell him, to give him a new identity and purpose and a destiny he could not have imagined. The Bible tells us that Jesus has many names: Messiah. Savior. Healer. Comforter. King. Lord. Teacher. Author and Finisher of our faith. Advocate. Shepherd. (You can find a longer list of the names of Jesus here.) As you pray today, do you sense any particular name that resonates with you and your emotions and circumstances at this moment? Let Jesus speak to you, through the Holy Spirit, about who He is to you today. Now, ask Jesus to tell you something about yourself that you may not know, or may need to be reminded of. What is Jesus’ name for you? What role does he have for you in His Kingdom?